Pumps that operate for extensive periods of time are subject to structural damage as well as wear and tear of components, regardless of whether they are for urban water supply and drainage, raw water intake in water treatment plants, or wastewater discharge from factories. These issues can cause urban flooding after torrential rain, water outages in industrial zones, and other major incidents. Therefore, water pumps require periodic repair and maintenance to ensure normal operation at pumping stations. To identify issues and perform repairs as quickly as possible, IoT technologies can be implemented to introduce remote monitoring and operation and management (O&M) systems to give complete control over the operating status of distributed pumps. This technology also converts traditional passive repair services to active inspection and maintenance to improve competitiveness. Remote water pump monitoring and O&M systems are active O&M services created from IoT concepts involving data collection, wireless transmission, and cloud integration technologies. Although there are many products with related technologies on the market, not all technologies are suitable for streamlined cloud management in such applications as pumping. Thus, for water pump manufacturers, opting for the wrong equipment runs the risk of incurring higher costs in after-sales services and greater effort with managing the new system. Compared to traditional systems that require the deployment of data acquisition modules, wireless communication modules, gateways, and other equipment for the uploading of water pump data to cloud platforms, Advantech's solution requires only the WISE-4471 NB-IoT wireless sensor node to connect device to cloud. This means that water pump manufacturers can adopt a remote monitoring and O&M system that saves time, effort, and operating costs while having zero impact on existing water pump control systems. This Chinese water pump manufacturer is dedicated to the R&D and production of various pumps. The company’s products are widely adopted in urban water supply and drainage, rural wastewater discharge management, road and intersection drainage, raw water intake, and secondary pressure water supply. Although the company has established more than twenty branches and service outlets, it struggled with providing timely repairs and maintenance to its customers. The company therefore aimed at implementing a remote monitoring and O&M system based on a cloud-based platform to provide added value after-sales services and to centralize the management of widely distributed pumping stations. As most pumping stations are located in remote regions, basements, building corners and underground, the adopted remote monitoring and O&M system required wireless network technology with wide coverage and a strong signal to ensure stable data transmission. For cloud management, because the company's engineers were mostly skilled in mechanical equipment instead of information technologies, the company's first choice was a public cloud supplier that could provide platform-as-a-service (PaaS) and software-as-a-service (SaaS) as well as customized apps and software. For the most critical connection from device to cloud, the company wanted to deploy minimal hardware to collect and upload data from pumping stations to the cloud. Because of limited space in mechanical and electrical control cabinets, a small and easy-to-install module that would not require changing the internal design of mechanical and electrical control cabinets was required. The module would also need to be equipped with protective measures against the harsh environments of pumping stations. With close collaboration between Advantech, China Telecom, and a public cloud platform provider, the water pump manufacturer was provided with an integrated NB-IoT deivce-to-cloud solution incorporating data collection, network transmission, cloud transmission, data storage, and data processing. This meant that end customers could login from any computer for monitoring and management. Operations start with the installation of Advantech’s WISE-4471 IoT wireless sensor node in the control cabinet of the water pumps. The nodes were connected via RS-485 serial ports to PLCs in the water pumps, thus enabling data collection (e.g., temperature, humidity, voltage, vibration, water levels, and noise levels). The module pre-processes and converts data into MQTT format for uploading once or twice daily to the remote monitoring and O&M system on the public cloud platform via a wireless network service provided by China Telecom's NB-IoT SIM card. This cloud platform with customized apps allows management to observe the starts, stops, and operating status of all pumping stations. The WISE-4471 comes with functions such as data acquisition, pre-processing, and direct cloud upload. It is the most suitable IoT module for cloud-based management of distributed equipment. It supports narrowband IoT (NB-IoT) radio technology, requiring that the user need only purchase a SIM card from teleco that provides NB-IoT communication services. This gives wide network coverage, high stability, low power consumption, and low rates. This project in particular benefited from NB-IoT's strong signal penetration, which alleviated concerns regarding communication interruption due to poor reception in basement pumping stations. Low power consumption and low rates significantly reduced the monthly electricity charges and network access fees required for system maintenance. 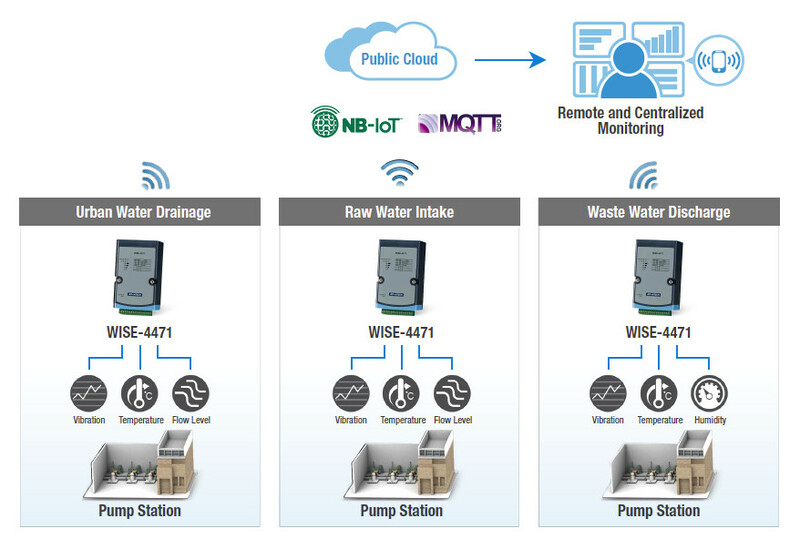 The WISE-4471 supports MQTT and can be easily integrated with private or public cloud platforms to provide convenient management of pumping stations where monitoring is required. The WISE-4471 is a compact module about the same size as a smartphone. It has a built-in antenna to reduce its footprint, making for easier installation in mechanical and electrical cabinets where space is lacking. Its wide-range operating temperature (-25~70°C), IP65 housing (water, dust, and oil-resistant), and M12 waterproof connectors make the module rigid and durable even under extreme conditions. Manufacturers of mechanical equipment, such as water pumps, generators, injection molding machines, and air compressors, must use innovative technologies to develop new products to win market share. After-sales services that meet customer needs are also crucial for winning customers, particularly in a highly homogeneous and competitive market. Good after-sales services improve a company's image and are one of the key reasons for repeat sales. The current water pump manufacturer decided to adopt the remote monitoring and O&M system and in doing so improve the added value of the water pumps, quality of its customer services, and market competitiveness. This has given the company a long-term competitive advantage in its industry. Advantech, China Telecom, and the public cloud platform have built an integrated NB-IoT device-to-cloud solution that only requires the installation of the WISE-4471 IoT wireless sensor module to connect PLCs in pumping stations to the cloud-based platform. Moreover, this is achieved without changing the existing structure of pumping stations. This solution easily provides NB-IoT communication capabilities for traditional equipment. The water pump manufacturer now successfully upgraded its operating model and has eliminated the need to send staff to inspect pumping stations manually. Give the vast distribution of stations across provinces and cities, the benefits of this centralized remote monitoring and management system are evident. The manufacturer has improved customer satisfaction and established an excellent reputation for high-quality services in the market.